In this class we will study of the great classics of English literature, The Canterbury Tales, in which we see Chaucer at the height of his poetic abilities, mixing sensitive characterization with stunningly complex storytelling. Disclaimer: The information on this page is provided as an overview. The course outline, readings, and assignments may be subject to change in the final syllabus as determined by the lecturer and/or preceptors. What is up with the frame narrative of Canterbury Tales? Why should we care about the Canterbury Tales today? In this class we will study of the great classics of English literature: Chaucer’s The Canterbury Tales. In the Tales, we see Chaucer at the height of his poetic abilities, mixing sensitive characterization and stunning complexity of storytelling with his inimitable wit and good humor. 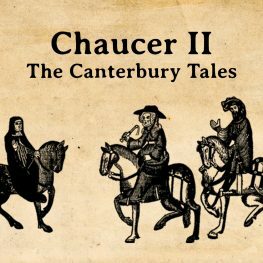 In our reading of The Canterbury Tales, we will look carefully at the intimate relationship between Chaucer’s stories and their narrative frame, between the tales and their tellers, and we will be watching how Chaucer engages and plays with his various literary sources. We will be reading Chaucer in his original Middle English, but no previous experience with Middle English is required for the class. Although not a prerequisite for this course, we encourage students to also take Chaucer I: Visions of Love, which covers the earlier stage of Chaucer’s poetic career. Note on Textbooks: Our primary textbook for this semester will be The Riverside Chaucer, the premier scholarly edition of Chaucer’s complete works. This book is expensive, but it will be the main textbook for both semesters of the Chaucer class, and it is a great book to have for the rest of your life, anyway. This course has been offered in the following semesters.